Whether they're collectible or for play, action figures are always in demand. They turn video games into interactive realities when paired with a system, spark your child's imagination and provide hours of repeat play. But how do you know if there's a small or hazardous part? What if they aren't enough to keep your kid's interest after the novelty wears off or if it will become obsolete quickly? That's where we come in. Our video reviews of action figures will help you to discover which ones are age appropriate for your little ones, have the right details to keep your children engaged and also provide enough appeal to make it a worthwhile add or investment for your collection. From comic book to movie and collectible figures to play, let us help you find a fantastic figurine that never goes out of style. There are many different types of action figures. Mass market action figures are sold in high quantities, designed as toys, though many are highly detailed to appeal to collectors. Limited edition figures, such as those sold by McFarlane Toys and other companies targeting collectors may have limited editions that sell out. Action figures as we know them today grew out of a long line of soldier toys and figures. Some small solider figures designed for kids were even made of lead in the 1920s! The Action Figure Category as we know it today really arrived in 1964. As Hasbro saw the success of Barbie, they wondered whether or not they could make a similar product for boys. But there was no way they could call it a "doll." Thus, the term action figure was born. The original figures were 12-inches tall and poseable, and boys played with them like dolls. It was a huge success, and two years later, Mattel introduced Major Matt Mason, a 7-inch figure. Matt and crew lived on the moon, three years before people made it there. While G.I. Joe was jointed to make him poseable, Major Matt Mason was molded out of a pliable plastic, which Mattel called "Plastizol" over a wire armature. That meant Matt was more poseable, but with a lot of play, the wires would stick through the surface. No matter, both lines were huge hits and opened the door to today's action figure category. 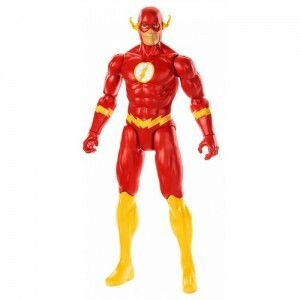 Action figures are a way that kids can play out with their heroes or aspire to become one. MEGO Toys was the company that made licensed action figures a hot commodity with kids introducing toys from the Marvel Comics and DC Comics library. Spider-Man, Captain America, Batman, Robin, Wonder Woman, and Aquaman were some of the popular characters they brought to toys. MEGO was also one of the first to create toys based on movies like Planet of the Apes. Through the years, the category continued to grow at a rapid rate as there were more cartoons and movies starring heroes that kids wanted to play with at home. In the 1980's, major introductions included Transformers, Voltron, GoBots, and Teenage Mutant Ninja Turtles. Many of these classic properties are still popular today, due to new toy lines, feature films, and new animated series, which means a whole new generation of kids are engaged with these characters. Of course, when you're talking action figures, you have to talk about the most popular action figure line of all time: Star Wars. When the original film was launched in 1977, Luke Skywalker, Princess Leia, Obi Wan Kenobi quickly became must-have toys, but not as big as the all-time best selling figure—Darth Vader. Sales of Star Wars toys are counted in the billions of dollars, and they show no sign of slowing down as the new trilogy introduces new characters, such as Kylo Ren and Rey, who are stars on screen and in the toy box. Collectors also drive sales of action figures; they're an important part of the Action Figure category. Many of today's most passionate collectors grew up with action figures. Many action figures are produced specifically for collectors. Lines from Star Wars, Marvel Comics, and DC Comics have outstanding lines. These are sometimes more expensive, but they feature greater details, more sophisticated materials and overall a much higher quality. If there's one category in the whole toy business that demonstrates that you don't have to grow up, it's Action Figures. Find your favorites here!